Sands of time passing quickly: our baby is driving! 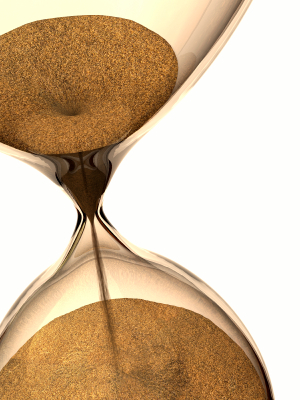 Today I realized how quickly the sands of time are passing through the hourglass of my life. Our youngest daughter Leah took and passed her driving learners’ permit. Our “baby” is driving! It’s so hard to believe because it seems just yesterday I was holding her as a newborn in her soft, white blanket. The years have flown, and as I look back in retrospect, I ask the question that haunts all moms from time to time when we’ve had a bad hair day and have been too impatient: Have I been a good mother? Am I a godly example to her of a wife and mom? That I need to smile, laugh, and relax with her and my family much more, and work less sometimes. My family is my greatest treasure, but do they really know it? Or am I sometimes too absorbed in other things? That I remember soon, all too soon, Leah will be grown – as her older sisters are – and the house will be much, much too quiet and my regrets much too loud. What then? As I lay in bed tonight, my heart filled with love for her and my eyes wet with tears, I am amazed that the years have passed so fast. My baby is driving now. My prayer is that with the rest of the years I have her here at home, I will consistently “ponder these things” in my heart, as Mary did, and BECOME by the power of Christ in me the great, godly mother she needs and I so desire to be. And that one day – by some miracle of God, by my own willingness to be completely broken and transformed before the Lord – yes, that one day, Leah and our other daughters will be able to look at me and say, “I’m so glad you are my mother, and that you have shown me how to be a woman of God” – before driving away to her destiny.